Adult Choir has around 25-30 regular members who practice Wednesday evenings 7:00 p.m. We sing in worship about twice a month. Our director is John Arndt, long-time church musician and teacher. Bell Choir (hand bells) has about a dozen members who practice Thursday evenings at 5:15 p.m. We play in worship the third Sunday of each month. Our director is Paula Meier, the hand bell choir director at Lutheran High School of Kansas City. Senior Youth meets regularly Sunday morning at 9:15 with adults for Sunday Bible Class, taught by the pastors. We meet together because High School students are highly capable and interested in learning the Bible and how to walk as Christians in today's world. There are typically 50 to 80 people who attend Sunday Bible class in our Fellowship Center. Our youth also take part in Faith Milestones events, gathering at church with parents to learn about particular announced topics. This fosters good communication within families about spiritual life. Occasionally we get together for fun fellowship activities, service projects, and mission trips. We often go to Colorado for a spiritually uplifting time of teaching and inspiration. Every three years we attend the National Youth Gathering of more than 30,000 youth in one place for worship, learning, and servant events to help the people in the host city. Junior Youth also meets Sunday mornings with adults in the Fellowship Center. Wednesday nights are really important for grades 5-8 at St. Matthew, as we gather at 7:00 for Confirmation (learning the basic teachings of Scripture: Commandments, Life of Jesus, Lord's Prayer, New Life in Christ in the Church and the World). They also have monthly activities and some Sunday night gatherings. Junior High Retreats are offered at a Missouri camp setting twice a year. Children's Ministry is a growing part of our congregation. Sundays (Sunday School) and Wednesdays (Midweek School) are prime time for children getting together, learning Bible stories, memorizing Scripture through word and song, and making crafts. Events and education are offered for families with grade school children, for fellowship and Christian instruction. Altar Guild - This faithful group of women meet monthly to discuss upcoming worship and sanctuary needs. 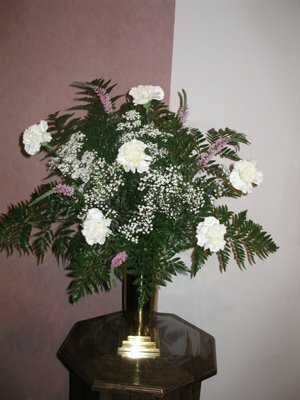 They set up communion, prepare fresh flower arrangements weekly, clean the chancel area, make banners, and prepare the sanctuary to be a holy place for all who arrive on Sunday for worship. They are women of prayer, who serve the Lord with love, and are always preparing for the presence of the Lord in His holy temple. Ushers & Greeters - Men, women, youth and families are invited to serve as Ushers and Greeters for worship services! Greeters welcome members and visitors to church at the 8:00 or 10:30 service, and Ushers hand out bulletins, help people locate seats, pass offering plates through the pews, and release rows to go up for Holy Communion at services in which it is offered. LWML (Lutheran Women's Missionary League) - We have two groups: Lydia Circle is our daytime group that meets on the second Thursday of the month at 12:30 p.m. in the Fellowship Room. Mary Martha Circle meets on the last Tuesday of the month at 7:00 p.m. in the Fellowship Room. They keep very busy with a combination of regular Bible study, care projects to bless people in our congregation, mission projects that bless the worldwide reach of the Gospel, fellowship events, and fundraising efforts for missions. LLL- (Lutheran Laymen's League) sponsors the monthly men's breakfast and Bible study and the Easter Breakfast. Care Ministry- This group meets monthly and remembers those who are facing illness, grief or other issues. They make visits, send cards and offer a shoulder to those in need. Mission Committee- This group maintains the Mission room and coordinates collections for the community. Sewing Group- Ladies of all skill levels cut and sew items for Children's Mercy, Hope House, Rachel House, Cancer Society and others.